1. High performance general purpose compact drive (V/F mode/Sensorless Vector mode). 2. 16 Bit Microprocessor Sensor less vector control. 3. V/F mode & Sensor less Vector mode. 5. Over load capability 150%, 1 minute. 6. Automatic torque boost & slip compensation. 7. Output frequency 0.1~600Hz, Programmable. 8. 16-step PLC run & 16 step preset speed. 9. PID feedback control & PG feedback control. 10. 2 accel./decel time selection (0.01~60000 sec). 11. 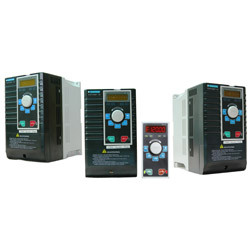 Pump control and automatic energy -saving. 1. 110V, 1-Phase: 0.2-1.5kW (0.25-2Hp). 2. 230V, 1-Phase: 0.2-2.2kW (0.25-3Hp). 3. 230V, 3-Phase: 0.4-7.5kW (0.5-10Hp). 4. 460V, 3-Phase: 0.4-7.5kW (0.5-10Hp). 5. Please refer to the attachment.